Mix up your routine with this beginner-friendly kettlebell workout. If you’re looking for a new way to challenge your body at the gym, a kettlebell workout is a great option for pushing your limits and mixing up your routine. 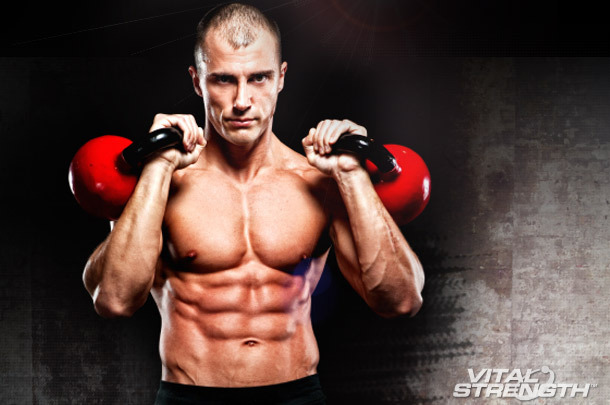 Kettlebell workouts combine different swings and lifts that use multiple joints and engage the larger muscles of the body, helping you to burn more calories per workout. Compared to dumbbells, a kettlebells thick offset handles make it easier for you to perform full-body exercises such as swings and squats. So if you haven’t picked up these cannonball-shaped weights yet, it’s time you do. Here is a beginner-friendly kettlebell workout from expert trainer Jason Griggs, that will give you a fast and effective full body workout. 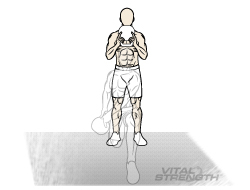 If you have never used kettlebells before start with 12kg (for men) and 8kg (for women). Complete each exercise back to back without rest until the circuit is completed. Once you have completed the circuit rest for 2 minutes and complete a total of 3 rounds. Start with a slower movement followed by a dynamic fast movement, doing this allows you to recover while being active between each of the dynamic movements, allowing your heart rate to raise and drop throughout the workout without compromising your energy levels leaving you too fatigued to perform the movements with strict form. Set up with your feet shoulder width apart, grip the bell by the handles with your thumbs facing out and then turn it upside down so the flat part of the bell is just in front of your face. 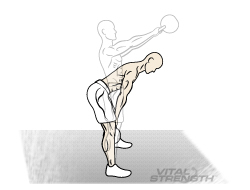 Dip slightly in the legs, making sure your back is straight. Then explode through your legs and press the bell at the same time. Once you have pressed the bell return it to the starting position by allowing it to fall down to the front of your face and bend your knees to cushion the bell coming down and allowing you to load up for the next rep.
Calves, quads, lower back, core, arms and shoulders. momentum will help with the following swings. Core, lower back, hamstrings and glutes. Start in a seated position with your back straight, leaning on roughly a 45 degree angle and keep your knees bent resting on your heels or elevated. Turn the bell upside down and hold it like you did for the push presses. Keeping your back straight twist from one hip to the other. Make sure to breathe in as you take the bell to one hip and breathe out on the way to the other hip. Keeping your chin tucked, arms relaxed and knees soft, fold over at the hips until your wrists are just below your knees. Row the bell to your chest by retracting the shoulder blades back like you are trying to squeeze a ball between them. Keep your elbows close to the body at roughly about a 45 degree angle. Core, lower back, arms and shoulders. 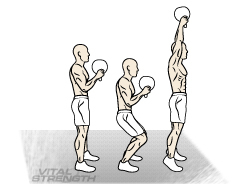 Start with your feet shoulder width apart, back straight and bell held upside down just like the push presses. Lunge forward (keeping your back straight) and chop the bell diagonally across your body, then return to the starting position by pushing backwards with your front foot and return the bell to the starting position as you do this. Make sure when you lunge that your back is straight and tall and your knees are behind your toes. Core, arms, glutes and quads. After your workout refuel your muscles with Vitalstrength Hydroxy Ripped, the perfect post workout shake.